"Kakko-sou" is perennial of "Sakura-sou" department. The flower which makes beautiful pink blooms under the tree in early May from late April has various expressions on every the community. 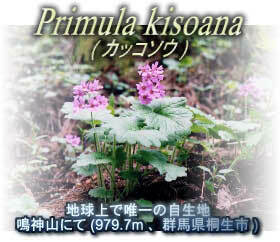 On the earth, with the only one growth place, Mt.Narukami in Gunma Prefecture Kiryu City.